Sold in a set of 2, our extra durable silicone EZ Grips are ideal for not only Fat Bar Training, but also turning any bar into an Easy Bar, promoting proper alignment on your joints throughout your workout. Our EZ Grips are latex free and due to their firm but plyable nature can be used on a variety of bars, kettlebells, and machines. WARNING! Before you purchase these EZ thick bar phat grips, you need to be sure that you want to build massive forearms and a grip like you've never had before! If you are down with getting strong, then these fatz grpz are for you! A must-have in your training arsenal!!! EASY TO USE! EZ Thick Grips come in a pair and are designed with a slit up the middle of the attachment so that they are very easy to take on and off any of your favorite weightlifting equipment and won't lose their shape over time. Made out of a non-latex, silicone material so they are firm but plyable to fit over various size bars. Our Fatgrips work great with dumbbells and cable accessories too. Great weight lifting accessories for men and women. YOU ARE ONLY AS STRONG AS YOUR GRIP! If you've been looking for a way to not only build hand, grip, and forearm strength but also ease the stress on shoulder joints, elbows, and wrists during your workout, then your search is over! That's because the combination of the ideal diameter with the ideal 17 degree angle of our product with a thick grip bar has been reported to shift the stress off the joints, resulting in more balanced muscle activation. FEEL THE BURN! You will see and feel a noticeable difference in your size and strength when using our EZ Grips trainer. These bar grips for weightlifting also work great for Crossfit, Strongman, Body Building, Bench Press, Dumbbell Weights, etc. You will find endless uses for these weight grips for fat bar training. MAKES A GREAT GIFT! Give your friends and loved ones the gift of extreme grip strength, super lift abilities and great form during their workouts. If you want no compromise on quality and results, EZ Grips are exactly what you're looking for. 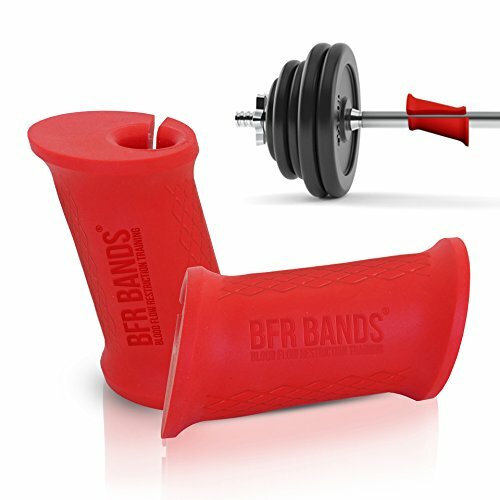 If you have any questions about this product by BFR BANDS, contact us by completing and submitting the form below. If you are looking for a specif part number, please include it with your message.